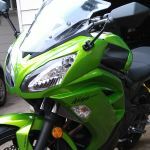 Hi all ....have noticed in the last cple of wks 2012 ninja 650 after market products have started hitting ebay ie: exhaust, windshields & bar ends e.t.c. The boy Youngs disciplinary record this week has been nothing but deplorable. I have purchased items from all the above sites with no problems at all. Another helpful site is - http://www.ninja650shop.com/ - although i haven't purchased any thing from these guys so can't give any advice. I am trying to find infill panels for the plastics around the rear seat so that i can get rid of the heavy handles that never get used. If anyone has any ideas please let me know. I've used Pro-Bolt 2 who r good www.probolt-australia.com. Don't no about infill panels. I reckon with the pillion handles u could probably unscrew them & take them off, Use the same size thread if u don't want to see the head fill the holes with expoxy resin (leave a Cple of .mil 4 expansion) tubes from the surf shop 4 $15, give it a gentle sand with some fine wet/dry paper (use soaked) then touch up with enamel spark black available not sure about green. Rear seat cowl & yr sorted!! If u eventually get yourself a girlfriend get yourself a older model rear seat with the strap. or know if the American ones fit please?